Try this quick FREE Intermediate Kettlebell Workout on for size. Go through this 2-3 times without stopping. Form first as always. Share this if you love helping others stay in shape in a short amount of time! I believe in order to be successful you must emphasize setting yourself up to be. Most times success doesn’t happen by accident. It’s something that takes focus, hard work, planning and sacrifice. I put a lot of energy and time in to setting up for each movement such as the Kettlebell Swing. I take set up very seriously! If I just hike the bell back without spending time on rooting my feet to the floor, driving my hips back to where they need to be, and so forth, the success output on this exercise will be low and chances of failing or injury are higher. If you set yourself up correctly and plan accordingly, chances of being rewarded are high. Today’s mantra: Believe you can do it and then set yourself up for optimal success. Our country may be extremely divided, but something I get to witness daily are Democrats and Republicans Squatting together. Yep and they don’t even fight. They squat together with love and respect. Some for 10+ years and then they go have coffee together afterwards. Maybe more people just need to train together so we can bridge this HUGE gap of divisiveness! Can we all agree on something? Squatting is amazing and helps with mobility, strength and improves the quality of life. 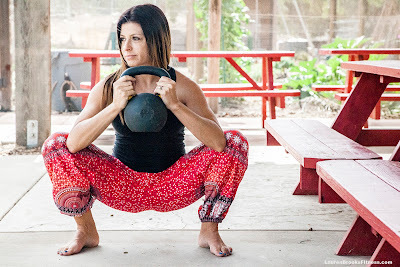 Personally, I find that hanging out in the bottom of the squat position feels like heaven. Please don’t stop squatting or choose not to learn due age or some theory that squats are bad. The only squats that are bad are bad squats or the ones you’re not doing!